Two photos by John from recent Sunday walks (23 August from Wyedale led by Jackie & Alan ; 30 August from Alstonefield led by Margaret). A rather late start taking buses via Sheffield meant that we arrived at Fox House after the heavy rain and walked most of the day in sunshine. 15 walkers and one dog set off initially to call at the Longshaw visitor centre to start with a coffee break ! 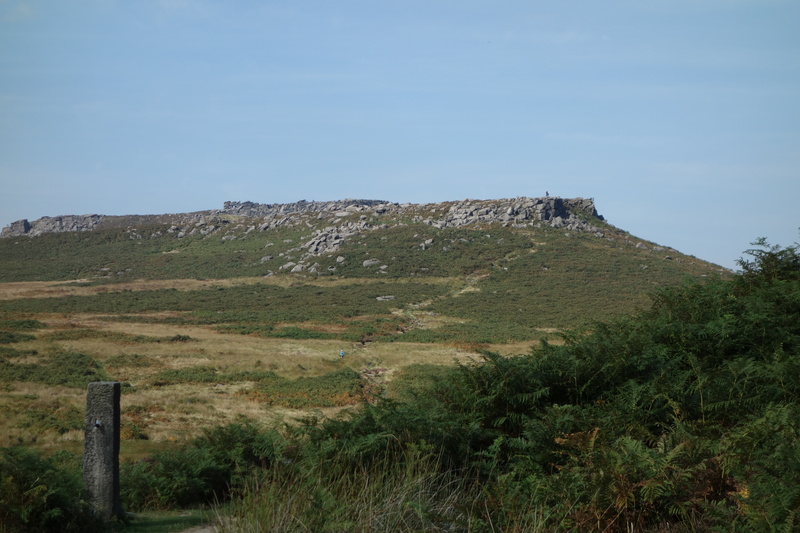 We then walked through the wood and across the A6187 to cross the shoulder of Carl Wark and ascend Higger Tor. The last few metres of ascent was a team effort as members helped each other over the rocks to reach great views at a welcome lunch stop. On then to Upper Burbage bridge and a crossing of the streams to return to the A 6187 along the top of Burbage rocks. Half the group then walked by the stream at the head of Padley Gorge and through the Longshaw estate to return to the visitor centre and Fox House bus stop – others took the shorter route direct to the visitor centre. Another in the series of Saturday strenuous walks – a Baslow ‘rollercoaster’, led by Jim. 20 miles with 2700 feet of ascent on a hot muggy day. The route was via Baslow Edge, Curbar Edge, Froggatt Edge, down to Stoke Hall, up to Eyam Edge and Riley Wood ; continuing to Abney Moor, Stoke Ford , Abney, Abney Clough, Foolow, Eyam, Hare Knoll, Calver, and Bramley Edge. Back for a drink at the Wheatsheaf in Baslow where the six walkers were able to view the thunderstorms which came minutes later. In praise of …. the ‘Peak & Northern’ Footpath Signs. In a world of change where so many things are ephemeral it’s good to see solid footpath signs that are there to last. Note: The long walk from Ilam scheduled for 29 August has been postponed until 3 October. The Open Spaces Society are a conservation group even older than the Ramblers, tracing their origins to 1865. Their views and action on the subject of footpaths are widely heard and respected. It’s therefore gratifying that they have spoken out against the proposed rights of way proposals being put forward by Derbyshire County Council. Their comments have been reported in the press and on TV. Our rights of way network is centuries old and must be preserved. The budget is already inadequate and the stringent cuts in the pipeline threaten the existence of the footpath network as we know it. 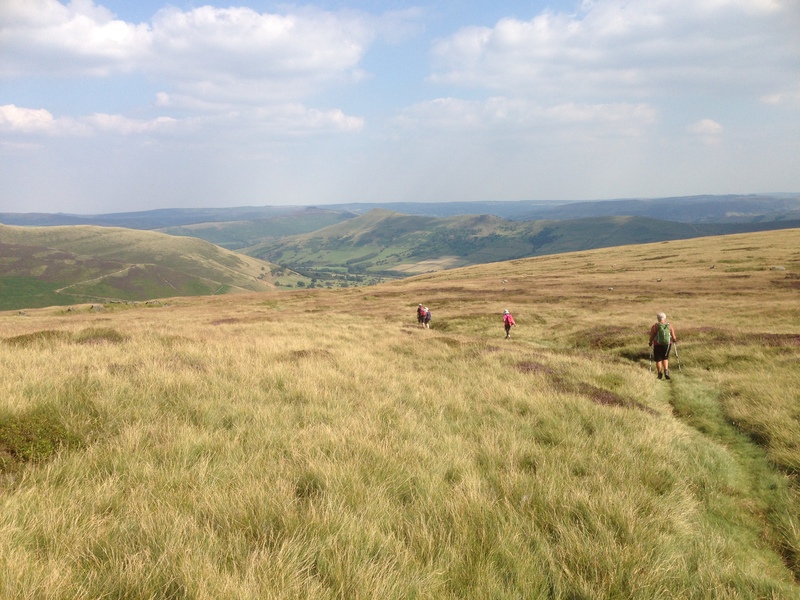 Every walker is urged to read the Open Spaces Society view and respond to the questionnaire from Derbyshire – which can be accessed from the Open Space Society comments. 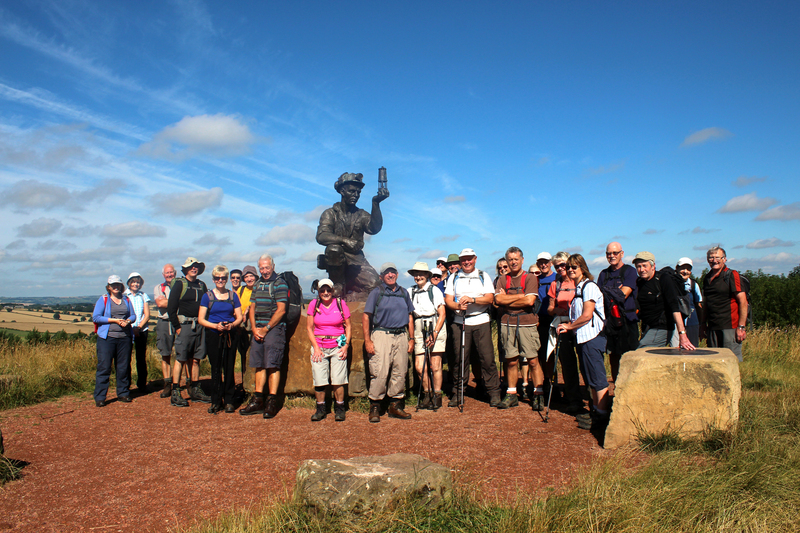 A circular from Teversal Visitors Centre for Bob’s walk via Hardwick and Pleasley, which included the brief trek up Nottinghamshire’s high point of Silverhill to pose with the Miner. A strong turnout today of 29 who made the eight mile circular journey with Kath & Eric from Bakewell Old Station via Haddon Hall and Lathkill Dale. The GHB Ward circular walk from Holmesfield via the Eastern Moors and the Longshaw Estate is a Derbyshire ‘classic’, easily accessible from both Chesterfield and Sheffield. Taking advantage of TM Travel’s £1 concession fare for bus pass holders who get up before 9:30 am, Andrew took a group of ten by bus to Holmesfield – and followed a close variation of the route. 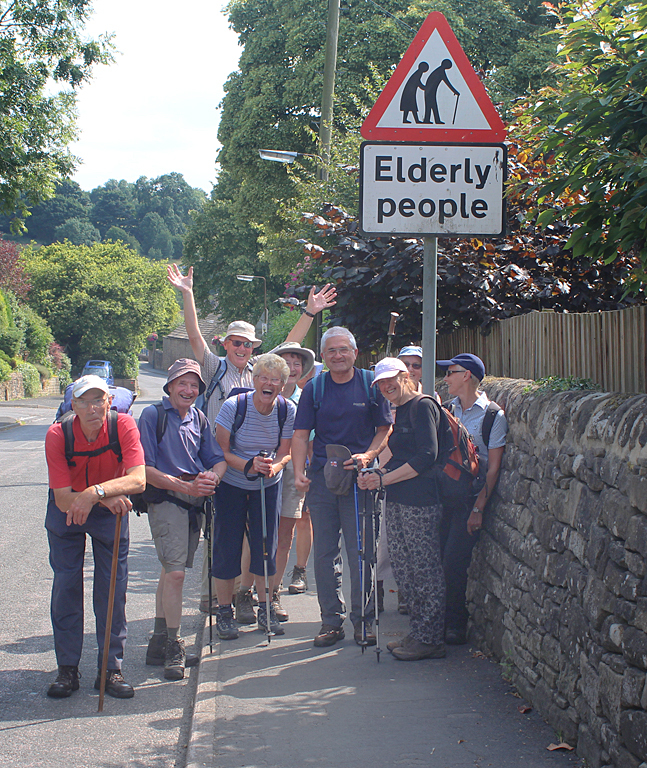 On a sunny summer day 14 ramblers set off from Shatton to walk an 11.5 mile circular route, led by Graham. They followed the river Noe to the stepping stones and turned up to Offerton Hall, and then across Offerton and Abney moors to Great Hucklow. From Hucklow it was down to Bradwell and back to Shatton via Townfield Lane. The walk with the visually impaired was led by Keith and guided by myself. From the Black Rocks, 12 walkers (including 4 visually impaired and 2 off-duty guide dogs) set off in fine, warm weather along the High Peak Trail – leaving at the National Stone Centre and walking by old mine workings and Dean Hollow to Middleton – where lunch was taken in the impressive Millennium Gardens. A short but steep climb then gave access to Middleton Moor with exhilarating views enjoyed by the sighted walkers all the way to Middleton Top. After a refreshment stop the group continued down the incline and followed the High Peak Trail back to Black Rocks to conclude a pleasant 5 mile walk. the Lost Lad cairn, Pike Low, and Wellhead. 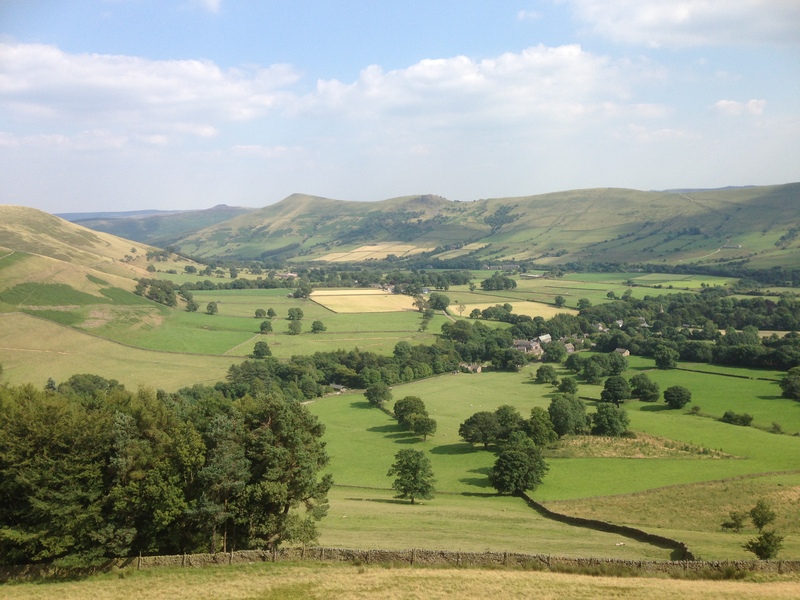 Another Hope Valley train ramble, this time from Chinley to Edale on a glorious walking day. Val led 11 from Chinley Rail Station past Mount Famine, Coldwell Clough, Edale Cross, and Grindsbrook Knoll, to Edale Rail Station for the 4:33 pm return. No murk or mist today – just the Kinder area at its glorious best. There were 13 of us on today’s 10 mile walk – a warm and sunny day. We started off in Lumsdale, near Matlock, and walked down past the interesting remains of the many former water powered mills in the valley, now in the care of the Arkwright Society. A climb up the steep bank up towards Riber then followed, pausing for coffee and cakes among the first of this season’s heather. After Riber, we walked over Bilberry Knoll and descended through Bow Wood to Lea Mills. The mills are thought to be the oldest continuously working mills in the world and were originally owned by relatives of Florence Nightingale (who was named after her Italian birthplace). Then on to High Peak Junction and the Cromford Canal. We lunched on the hillside before climbing up towards Holloway , passing Florence’s childhood home, and continued on to Lea and Dethick. Here we stopped , looked around the ancient church and were reminded of the part played by the hamlet in a plot to overthrow Queen Elizabeth 1 and put Mary Queen of Scots on the throne in her place. Next we walked through Tansley village before our final , rather tired, climb back to Lumsdale. 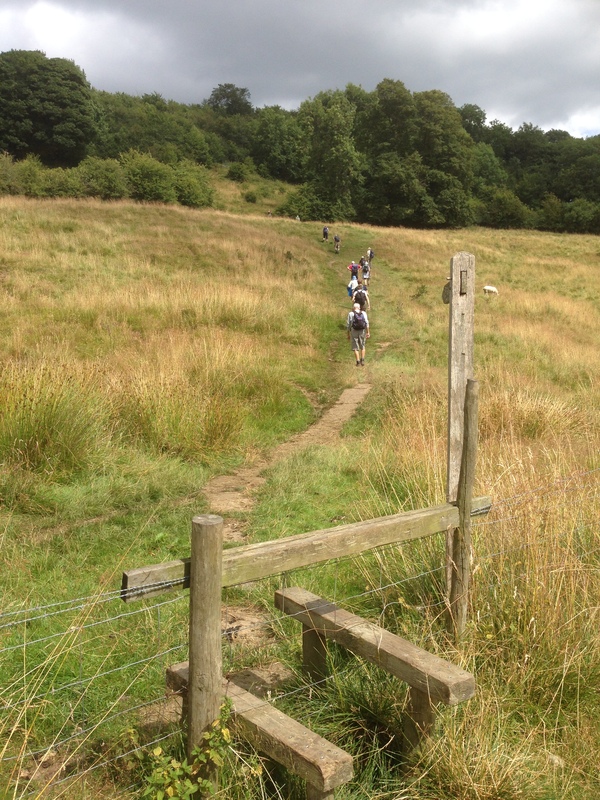 The Goyt Valley 8 mile circular route attracted 20 walkers. The ruins of Errwood Hall were explored soon after the start of the walk. Previously the hall had been the home of the Grimshawe family who occupied the hall for 100 years before it was demolished in connection with the construction of Fernilee Reservoir in 1934. We continued with an ascent of Foxlow Edge with stunning views of the Goyt Valley and beyond. 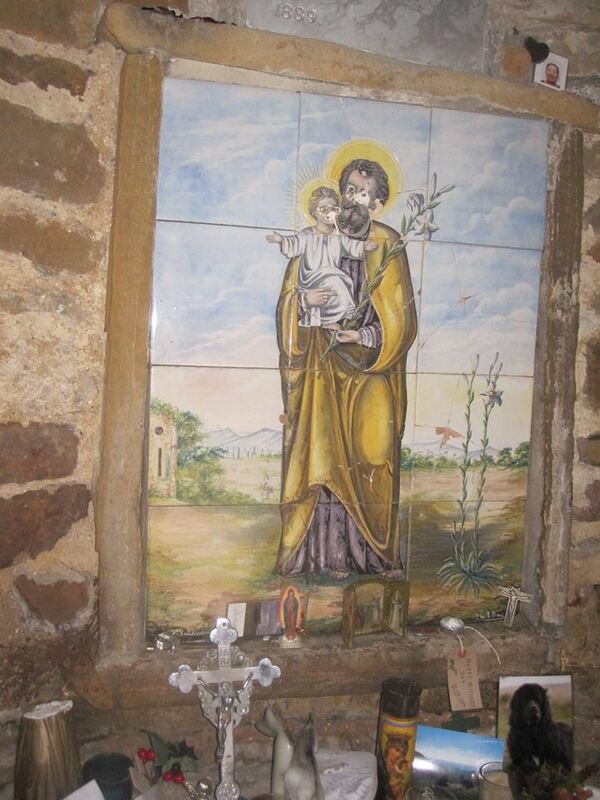 A visit was also made to the shrine or small chapel which had been erected by the Grimshawes in memory of their Spanish governess, Miss Dolores de Ybarguen. A climb followed to the highest point of the walk at Windgather Rocks and continued along Taxal Edge with extensive views of the surrounding hills before descending to the Midshires Way and back to the Errwood Reservoir. Summer moves on. 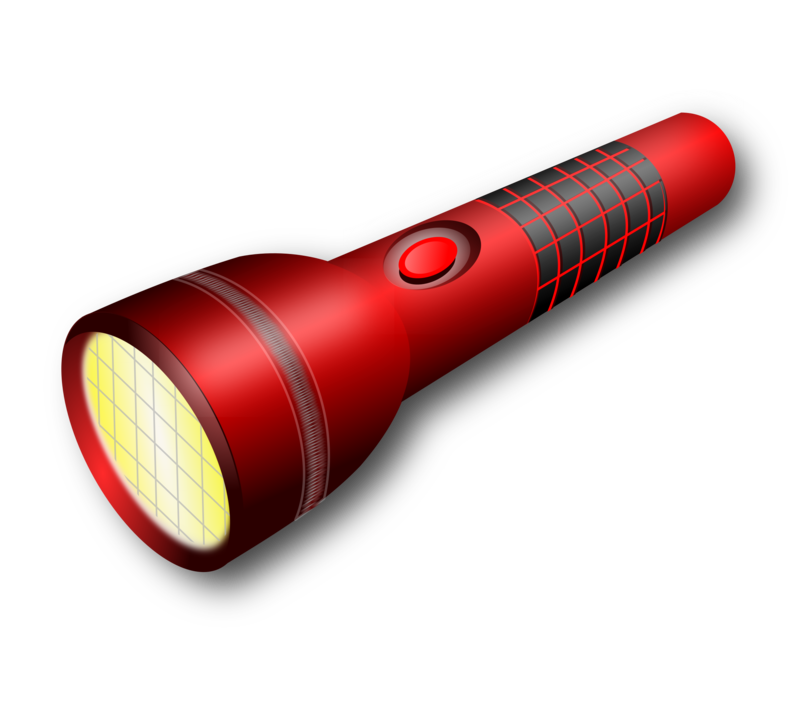 The official Wednesday evening walks ended last week, but with the sunset scheduled for 8:53 pm, David led ten on an extra one from Dronfield Woodhouse around Cowley, Cartledge, and Holmesfield. 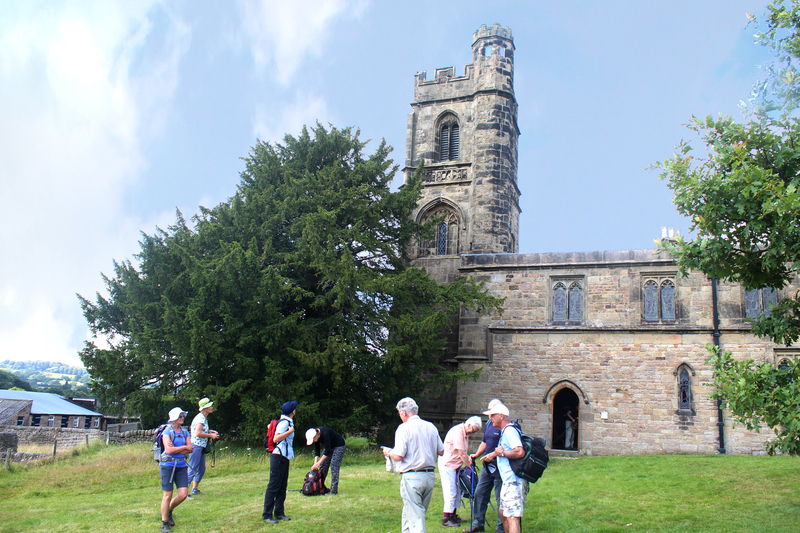 The ‘long car walkers’ explored the Ashover skyline and the Amber Valley today in an 11 mile walk led by Mike, covering Ogston and Brackenfield. Walking on cleared paths through crops is vital to our summer programme and the proposed opt out by the County Council to enforce landowners’ legal responsibilities could play havoc with our programme in future. Nine walkers followed a 15 mile route from Gradbach, via Luds Church, the bottomless Doxey Pool, and Gun Hill – led by John H.
Slightly shortened at Hen Cloud, owing to heavy rain – but an enjoyable trip to Staffordshire nevertheless.